Democrat Beto O’Rourke is closing in on Ted Cruz in the upcoming Senate race. The Lone Star state is ardently Republican, but trade war and border controls don’t help a business-friendly, export-heavy economy in the grip of labor shortages. Tricky trade-offs loom elsewhere too. Republican U.S. 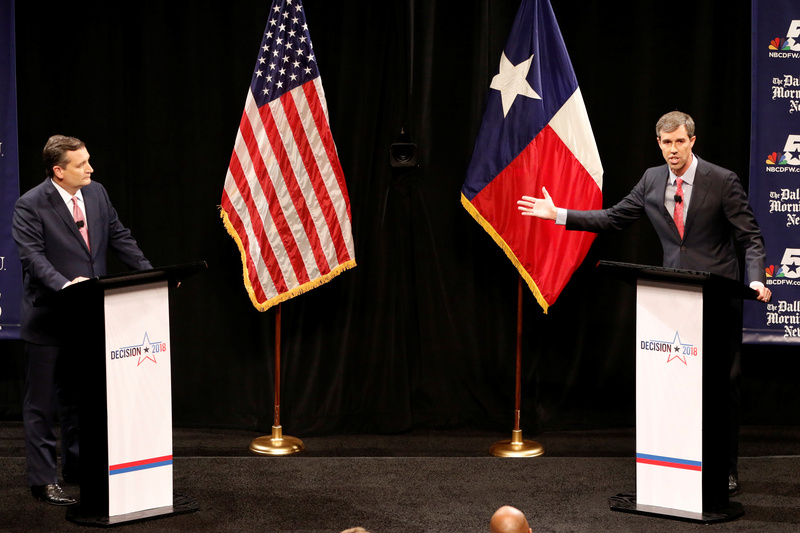 Senator Ted Cruz (L), and Democratic U.S. Representative Beto O'Rourke hold their first debate for Texas U.S. Senate seat at the Southern Methodist University in Dallas, Texas, U.S., September 21, 2018. Texan Senator Ted Cruz and Democratic challenger Beto O’Rourke participated in a debate on Sept. 21. Both are standing in the U.S. mid-term elections that take place on Nov. 6. The face-off took place in Dallas at the McFarlin Auditorium of Southern Methodist University. The venue hosted Martin Luther King Jr. in March 1966, according to SMU. The auditorium holds more than 2,000 people, but each candidate was given 120 tickets for the debate. A poll from Emerson College on Aug. 27 showed the two candidates in a dead heat.